The holy grail is real: At Wednesday Build conference keynote, Microsoft CVP of operating systems David Treadwell announced that universal apps are coming to the Windows ecosystem, thanks to Windows RunTime coming to Windows Phone 8.1. In other words, developers will be able to write one app using common code and have it work across phones, tablets, PCs, and yes, even the Xbox One—something that Apple and Android can't claim. Developers will also be able to create tailored experiences for each device type, if they so choose, but reuse the bulk of the code for all the apps. A general lack of apps are a common complaint about Windows 8's Windows Store as well as the Windows Phone store; introducing universal apps could give both ecosystems a much-needed kickstart, feeding off each other. 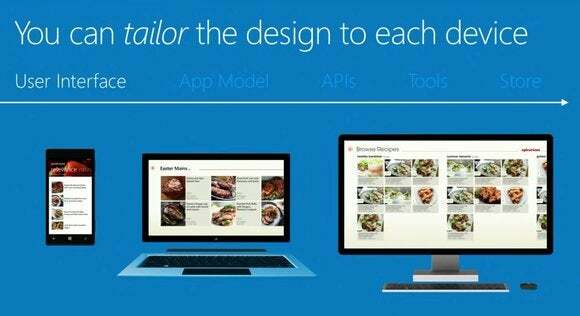 Microsoft did not announce a universal app store, but it did introduce "shared app identities," which allows you to create a unified experience across device. For example, developers can allow users to buy an app once, and have it run on all Windows devices without needing to buy the app again. The same goes for in-app purchases, and cloud storage and notifications can also be shared across devices. This article has been updated to add the Xbox One and correct David Treadwell's name.